It's like having two great pillows in one! The Lavender Latex Pillow by Natura has two distinctive sides: one with granulated latex, for a comfy, cradling feather-down feel; and solid latex on the other side that provides extra support for shoulder and neck muscles. Either way, it helps you get a great night's sleep - enhanced even further by the pleasant, relaxing fragrance of real lavender! Lavender can help promote a deep, restful sleep while relaxing your entire body. Some nights you just want to sink into a pillow that's as light and fluffy as a cloud. On other nights, you might prefer more support. 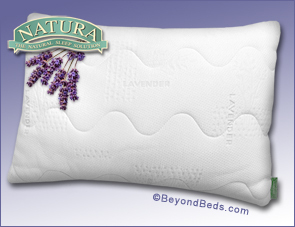 Amazingly enough, the Lavender Latex Pillow by Natura does both! The dual-sided latex core combines the cuddly softness of granulated latex on one side - with the resilient, contouring support of a solid latex core on the other. Latex is hypoallergenic, antimicrobial and dust-mite resistant - a critical consideration for those with allergies or respiratory conditions. 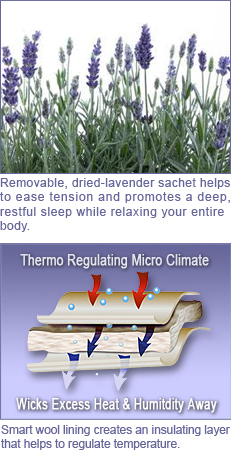 The lavender-infused cotton-blend cover and removable, dried-lavender sachet helps ease tension and facilitate sleep. Lavender has been widely used to naturally treat insomnia, and it's a wonderful way to relax and let the cares of the day melt away. The 10 oz. NaturaWool lining also enhances comfort. It moderates the temperature next to your skin, so you don't have to toss and turn as much. And it wicks away excess moisture, creating a fresh, dry sleep environment that won't let common allergens and bacteria flourish. Standard: 25.5" x 20" x 6"
Queen: 29.5" x 20" x 6"
King: 35" x 20" x 6"
Warranty: 5-Year Limited. Made in Canada. Note: Please allow 7 to 10 days for delivery.